After encountering hundreds of highsec miners, I have noticed that they tend to be very similar to one another--even to the point of saying the exact same things as other miners from across highsec. Why are they so lacking in individuality? Clearly, the acts of botting, AFK mining, and excessive mining have stripped away much of their humanity. But you know what they say: When life hands you lemons, make lemonade. 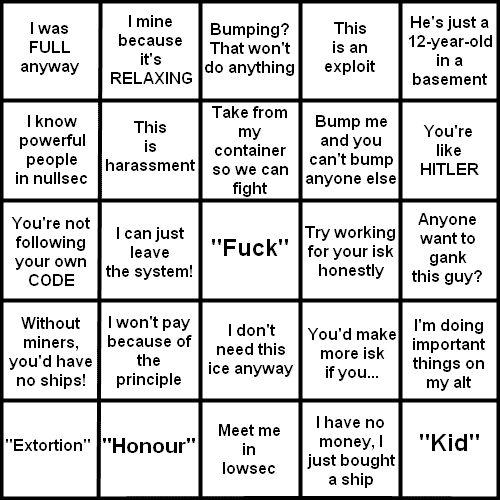 I present to you Miner Bingo! How quickly can you get a Bingo after bumping highsec miners out of range?